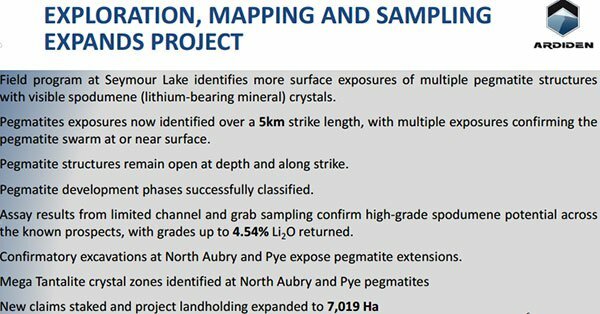 Promising assay results from Ardiden’s (ASX: ADV) Seymour Lake lithium project suggest the company is well positioned to deliver a robust initial maiden resource estimate for the North Aubry prospect, part of the broader Seymour Lake lithium project. This news sparked immediate interest in the stock today with its shares spiking approximately 10% as the announcement was released to the market. Please note that ADV is an early stage play and past trading history is not necessarily an indication of future share price performance. This data alone should not be used as the basis for an investment decision and investors should seek professional financial advice before making an investment decision. As a backdrop, the Seymour Lake lithium project comprises more than 7000 hectares of mining claims and has over 4000 metres of historic drilling. Mineralisation is hosted in extensive outcropping spodumene bearing pegmatite structures with widths up to 26 metres and grades of up to approximately 2.4% lithium dioxide. Management highlighted today that 85 of the 310 drill core samples analysed to date had produced significant grades with 36.5% or 31 samples returning assays of greater than 1.5% lithium dioxide, a level viewed as high range. There were also some intersections well above 1.5%, most notably 18.2 metres grading 2.3% from 2.5 metres downhole including 11 metres at 3.1%. Additional assay results will be received shortly which will assist the company in completing its initial maiden resource estimate. Management summed up these recent developments in saying they confirmed the potential of the project, putting it on track to complete a maiden mineral resource estimate early next year, a development that could potentially be a share price catalyst. However, those considering ADV should not base investment decisions on forward looking statements or estimates regarding potential exploration results. ADV is an early stage exploration stock, and given its highly speculative nature independent financial advice should be sought. Management suggested there is a strong possibility of further exploration upside given the fact that the holes were only drilled to a maximum depth of 51 metres and were not deep enough to intersect the numerous substantial secondary layers of pegmatite mineralisation, beneath and parallel to known exposures. 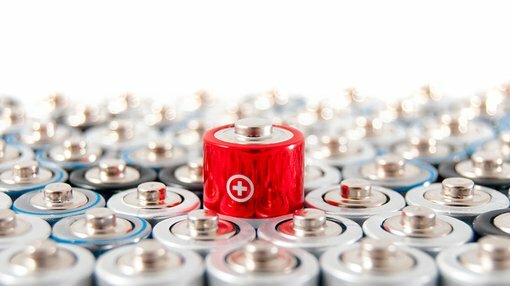 Given these developments ADV will seek to expand the initial maiden lithium resource at North Aubry in a number of stages once the other prospects along the first 1 kilometre of the overall 5 kilometre strike length are progressively drill tested next year. These include Central Aubry, South Aubry and Pye.